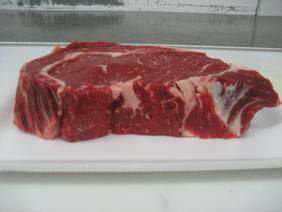 A ribeye is a rib steak with the bone removed, they are very tasty, have a rich smooth texture, that delivers tremendous flavor and is well suited for grilling, broiling and pan-searing. Trim off any excess fat, but leave at least 1/4" of fat to keep juices from escaping. Season both sides of the steak with salt and pepper, ribeye steaks have great flavor all on their own but if you want to add more flavor, season steaks with a dry rub just before cooking, or marinade briefly. 2. If using a gas grill, first brush the grill with vegetable oil to prevent sticking, preheat on high for 10-15 minutes with the lid down. 3. This method of cooking works best with steaks that are 1 inch or thicker. Scrape the grill clean with a grill brush, leave one side on high and adjust the other side to medium heat. The key to not overcooking a thick ribeye is to sear the steak on both sides. On the high temperature sear the steaks about 2 minutes on each side with the lid down. 4. Once the steaks are browned on both sides, slide them to the cooler part of the grill, continue grilling ribeye with the lid down to the desired doneness. For maximum flavor and tenderness cook to medium-rare (135 degrees) or to medium (145 degrees), anything more will begin to dry out the steaks. When cooking with a charcoal-grill, build a two level fire by stacking most of the coals on one side and the remaining coals in a single layer on the other side of the grill. This works the same way as the gas grill, searing the steaks for 2 minutes per side over the high coals and then sliding them to lower heat to finish. Sear the ribeye steak on each side for 2 minutes on high heat, then move steaks to medium heat, continue cooking following the chart per minutes on each side on the medium heat until desired temperature is reached. For example a 1 inch steak grilled to medium-rare would be 4-5 minutes on each side after the initial searing on high heat. 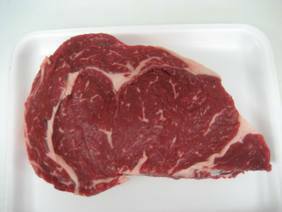 A Ribeye steak ½-¾ of an inch should not be seared on high heat, searing a thin steak will brown the exterior but quickly dry out through the center. 1. If using a gas grill, first brush the grill with vegetable oil to prevent sticking, preheat on high for 10-15 minutes with the lid down. Scrap the grill clean with a grill brush, and adjust the heat to medium-high.